season-opening gala on March 3-5 added a welcome bit of colour to what was largely a dull and wet weekend. It was the Crimson Lake Mogul’s first foray onto KWVR metals, having made the journey from the East Lancashire Railway a few days before. Naturally, the loco was in demand for the photo charter market, and good use was made of it with a string of vintage carriages during a 3P20 Parcels Group event on February 29 when the sun did mercifully shine. 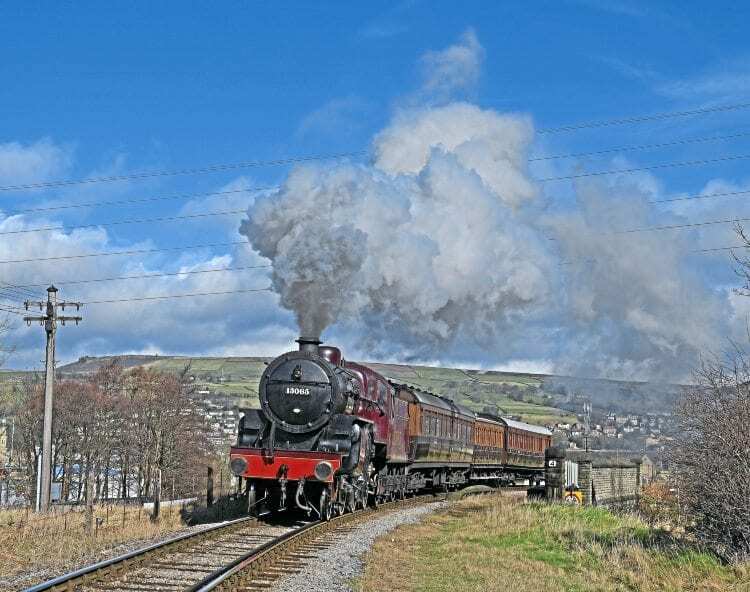 Making a welcome return to the Worth Valley was the line’s own Stanier ‘5MT’ No. 45212, which had just completed its first main line test run around the Hellifield loop following the fitting of OTMR and TPWS at Heywood. The ‘Black Five’ is on loan to Ian Riley, who has funded the overhaul to main line standard in return for use of the loco. The March 3 test was its first main line run since 1968.